Hibiscus is the common name and genus name for a group of about 250 species of shrubs, trees, and herbaceous plants in the mallow family (Malvaceae), characterized by alternate leaves and generally large and showy, often bell-shaped flowers with stamens united into a tubular structure surrounding the style. Hibiscuses typically have five sepals and five petals, or the sepals may be basally connected to form a calyx with five teeth. Also known by the common name of rosemallow, this genus includes such well-known members as rose of Sharon (Hibiscus syriacusand) and China rose (Hibiscus rosa-sinensis), with roselle (Hibiscus sabdariffa) being the most commonly known species for medicinal purposes. Hibiscus plants provide important ecological, aesthetic, culinary, and medicinal values. Ecologically, the large hibiscus flowers provide nectar to such large pollinators as hummingbirds. They also are used as food plants by many insects. For humans, the hibiscus flower is renowned for its beauty. With numerous varieties, cultivars, and hybrids, coming in a variety of colors (red, white, pink, orange), with a single or double set of petals, and being often large and trumpet shaped, the hibiscus is popular as a garden plant and as a potted plant, while a single flower is traditionally worn by Hawaiian women. Various plants also are used medicinally, to treat a wide variety of ailments, and are used for culinary purposes, making popular commercial teas. Thus, the hibiscus plants, while advancing their own individual function (reproduction, survival, and so on), also advance a larger function for the ecosystem and for humans. Malvaceae, the flowering plant family to which Hibiscus belongs, contains such well known members as cocoa, cotton, okra, and baobab. Members of this family generally have leaves that are alternate, often palmately lobed or compound and palmately veined. The margin may be entire, but when dentate a vein ends at the tip of each tooth (malvoid teeth). Stipules are present. The flowers generally have five valvate sepals, most frequently basally connate, and they have give imbricate petals. The stamens are five to numerous, connate at least at their bases, but often forming a tube around the pistils. The pistils are composed of two to many connate carpels. The ovary is superior. Capitate or lobed stigma. The flowers have nectaries made of many tightly packed glandular hairs, usually positioned on the sepals. 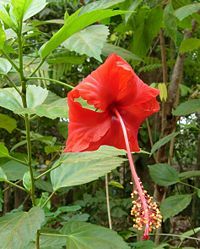 The Hibiscus genus includes both annual and perennial herbaceous plants, and woody shrubs and small trees. The leaves are alternate, simple, ovate to lanceolate, often with a toothed or lobed margin. The flowers are large, conspicuous, trumpet-shaped, with five or more petals, ranging from white to pink, red, purple, or yellow, and from 4 to 15 centimeters(1.5-6 inches) broad. The fruit is a dry five-lobed capsule, containing several seeds in each lobe, which are released when the capsule splits open at maturity. The various species of hibiscus are popular for ornamental, medicinal, and culinary purposes, as well as used in spiritual traditions. A white Hibiscus arnottianus in Hawaii. Many species are grown as ornamentals for their showy flowers or used as landscape shrubs. China rose (H. rosa-sinensis), also known as Chinese hibiscus, is an evergreen flowering shrub native to East Asia. It is widely grown as an ornamental plant throughout the tropics and subtropics. The flowers are large, generally red in the original varieties, and firm, but generally lack any scent. Numerous varieties, cultivars, and hybrids are available, with flower colors ranging from white through yellow and orange to scarlet and shades of pink, with both single and double sets of petals. Hibiscus schizopetalus is a species native to tropical eastern Africa in Kenya, Tanzania, and Mozambique and has very distinctive red or pink flowers with frilly, finely divided petals. This is a popular plant for hanging baskets. Hibiscus is used medicinally for a wide variety of ailments. Most commonly used medicinally is H. sabdariffa, known as roselle, but also popular are H. rosa-sinensis (common hibiscus, China rose) and H. syriacus (rose of Sharon). Roselle is said to lower fevers and high blood pressure, relieve coughs, increase urination, and kill bacteria. China rose is used primarily for respiratory problems, but also for skin disorders and to treat fevers. Rose of Sharon is used externally as an emollient to soften and soothe the skin, as well as used internally for digestive disorders (Kim 2005). Hibiscus, especially white hibiscus, is considered to have medicinal properties in the Indian traditional system of medicine, Ayurveda. Roots make various concoctions believed to cure various ailments. Other healing properties attributed to hibiscus preparations include for hair loss, relief for menstrual cramps and for the pain in childbirth. Studies have shown hibiscus to be hypotensive (lower blood pressure), antispasmodic (suppress spasms), and antibacterial, as well as effective against tuberculosis (Kim 2005). Since some species are used as abortifacients (induce abortions), preparations should not be used by pregnant or nursing women (Kim 2005). Many commercial herbal teas contain hibiscus. roselle (Hibiscus sabdariffa) is used as a vegetable and to make herbal teas and jams (especially in the Caribbean). Hibiscus is a primary ingredient in many herbal teas. In Mexico, the drink made with hibiscus is known as Jamaican water or agua de Jamaica and is quite popular for its color, tanginess, and mild flavor; once sugar is added, it tastes somewhat like cranberry juice. Dieters or persons with kidney problems often take it without adding sugar for its beneficial properties and as a natural diuretic. It is made by boiling the dehydrated flowers in water; once it is boiled, it is allowed to cool and is drunk with ice (Vinculando 2005). In Egypt and Sudan, roselle petals are used to make a tea named after the plant karkade. Dried hibiscus is edible, and is often a delicacy in Mexico. The bark of the hibiscus contains strong fibers. They can be obtained by letting the stripped bark sit in the sea in order to let the organic material rot away. In Polynesia these fibers (fau, pūrau) are used for making grass skirts. They have also been known to be used to make wigs. The natives of southern India use Hibiscus rosa-sinensis for hair care purposes. Extracts of the red flower and leaves can be applied on hair tackle hair-fall and dandruff on the scalp. It is used to make hair-protective oils. A simple application involves soaking the leaves and flowers in water and using a wet grinder to make a thick paste which is used as a natural shampoo. In temperate zones, probably the most commonly grown ornamental species is Hibiscus syriacus, the common garden hibiscus, also known in some areas as the "Rose of Althea" or "Rose of Sharon" (but not to be confused with the unrelated Hypericum calycinum, also called "Rose of Sharon"). In tropical and subtropical areas, the Chinese hibiscus (H. rosa-sinensis), with its many showy hybrids, is the most popular hibiscus. Hibiscus lobatus in Hyderabad, India. Ingram, D. L., and L. Rabinowitz. 2003. Hibiscus in Florida. Fact Sheet ENH-44. Environmental Horticulture Department, Florida Cooperative Extension Service, Institute of Food and Agricultural Sciences, University of Florida. Retrieved December 30, 2008. Kim, K. Y. 2005. Hibiscus. In J. L. Longe, The Gale Encyclopedia of Alternative Medicine. Farmington Hills, MI: Thomson/Gale. ISBN 0787693960. Vinculando. 2005. Flor de Jamaica orgánica de México (Hibiscus sabdariffa L.). Vinculando May 17, 2005. Retrieved December 30, 2008. This page was last modified on 20 January 2009, at 00:50.